I feel like there's always judgement on parents for what they are/aren't teaching their children. It's hard raising kids and hoping you are teaching them all the things they need to know. 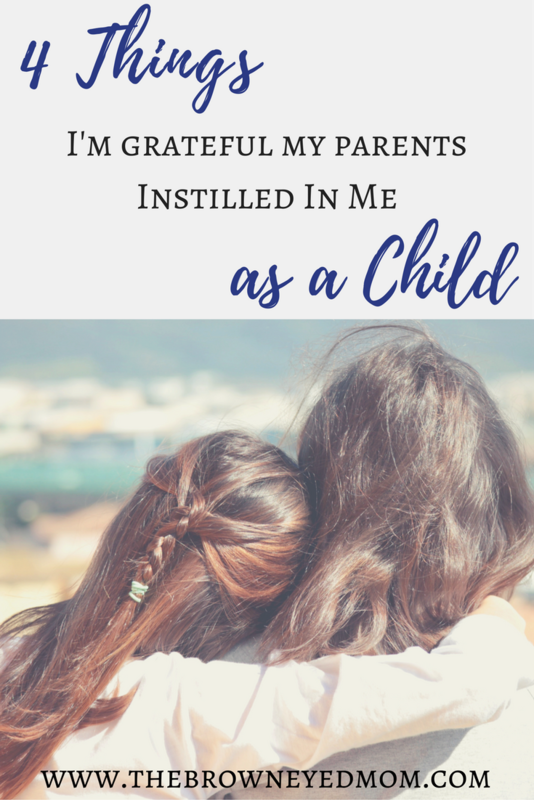 There are 4 things that my parents instilled in me while I was growing up that I hope to instill in my children as well. This value seems to have gone by the wayside as decades come and go. I remember my parents being very adamant that I was respectful to adults, myself and to my peers. Yes ma'am. No sir. Please and Thank You. Our older son just turned 4 and I have also been adamant as well with him to use his manners and have had family and strangers compliment him on those manners. I want to instill in him that in order to be respected, you need to respect others as well. He has a hard time being social, but we are trying to teach him that when he is with us and people greet us as a family, he is to greet them back along with us. Thinking back, I can remember my parents sitting down when it was time to pay bills and divvying up what money needed to go where and when to pay it. The biggest thing I remember is a check being made out to the church for their tithe. Growing up, we definitely weren't the richest people on the block, but my parents always made it work. I feel like God took care of us because of their faith that He would provide for us. I want our children to see us taking care of our finances and giving our portion to God first and foremost. In a throw-away society, I really admire this idea. When our kids are rough with their toys, we remind them to be gentle with them and not break them. Our oldest went through a phase where if he was being rough with something, he would just say "That's ok mom, we can just get another if it breaks". He was still in daycare at the time and one of the teachers would tell the kids that when they broke a crayon while coloring. So he decided to apply it to every situation. Luckily, we've moved past that phase. We continually work on it, but I want my kids to know that just because something can be replaced doesn't mean we don't take care of it. This way, we can use it for as long as possible. I remember being my oldest son's age and just NOT wanting to eat something on my plate. I was a notoriously picky eater and would take the teeniest, tiniest little bites then say I didn't like it. But my parents always made me try things no matter how much I protested. And you know what? Some of those things I ended up liking. Some of them, not so much. But I did learn to like many of them as an adult. Being a parent now, I want the same for our boys. So every meal we have that Tiny Human #1 turns his nose up at, he has to try it. He'll eat a lot of different things, but sometimes we have to instill the rule he actually made up. He decided if we are going to make him eat something, he had to take as many bites as he was old. So now that he's turned 4, he has to take 4 good bites. Win for everyone! What values did your parents instill in you as a child that you want to pass down to your own children? Like what you read and know someone who may as well? Share this post!